Is It Illegal to Attach a Camera to Your Motorbike Helmet? What Size Dirt Bike Do I Need? Can You Patch a Motorcycle Tire? When Should You Replace Your Motorcycle Helmet and Why? What Injuries Can a Motorcycle Helmet Protect You From? When Will Your Motorcycle Battery Die? Do Motorcycles Have Storage Compartments? There are two types of bikers, those that like riding in the rain, and those that simply hate it. 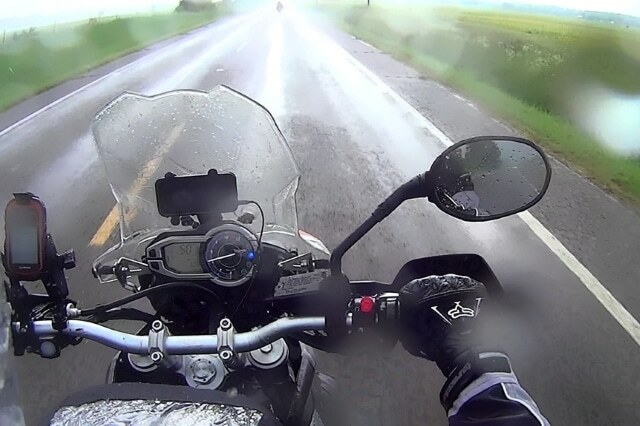 No matter the kind of rider that you consider yourself to be, there are a few aspects that you should have in mind when riding in challenging weather situations. To be of assistance to you, we have prepared a list of tips that you should check out. When riding in the rain, you should be equipped with a high-quality rain suit as it will help you stay dry so that you won’t feel too cold. This aspect is particularly important because, when you don’t feel entirely comfortable, there is a chance that your ability to concentrate and control the bike will decrease. Also, because, in these circumstances, the air is filled with moisture, it is recommended that you use a visor that is not likely to get fogged. Even more so, it is advisable that you switch your dark visor for a clear one or one that has a yellow shield. By doing so, you will be able to see the road at all times. Next, given that your hands are likely to get cold first, it is also a good idea to keep them dry and warm by using a pair of gloves that have a waterproof membrane. A neck warmer and a sturdy pair of boots are also must-haves. If you have to ride in conditions that are less than ideal, seasoned bikers recommend that you change the way you usually handle the motorcycle. Therefore, any throttle adjustments are best to be made smoothly and in small increments. Apply the brakes gradually so that the braking is done early. Consequently, in the last part of the braking zone, you won’t have to abruptly pull the brake lever. For extra safety, you should also pay attention to intersections. Because many cars come to a stop in these areas, the oils on the pavement are very dangerous. So, it is best that you decrease your speed whenever you approach intersections. Plus, you should not run yellow lights. When you are waiting at a red light, you should always check your rear-view mirror so that cars don’t slide into you unexpectedly. To avoid such problems, you could also double the following distance so that vehicles that stop suddenly don’t take you by surprise. During rainy days, you should be aware of utility hole covers and sealer pavements, as they tend to be quite slippery. When given the possibility, try to avoid riding over them. If this is not possible, try to resist braking or accelerating when rolling over them. On top of that, if you have to cross over railroads, you should be very careful as your tires are likely to slide on the steel. Because of this, you should approach them in a position as close to perpendicular as possible. One of the most important tips that you should remember is that it is vital that you stay relaxed while riding. This way you won’t stress yourself out, and you will be able to handle all the situations that the road throws at you. Additionally, it is essential that you do not combine several actions. Instead, focus on each process independently. For instance, you might want to finish your deceleration before you turn into a corner. As a result, the traction demands that are put on the tires will be reduced. Although some car drivers might step on your nerves, it is imperative that you remain calm. Always remember that starting a fight when trying to ride in difficult meteorological conditions is not the best decision. Instead, try to keep focused on your primary goal, that is, reaching your destination safely. If you notice an unsafe driver behind you, let him/her pass you so that you can keep him/her in front of you. 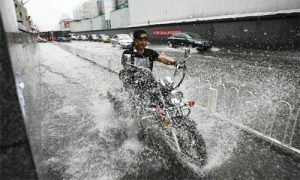 As many bikers pointed out, when riding in demanding weather conditions, investing in waterproof gear is not sufficient. If you want to be safe on the road, it is vital that you also purchase pieces of equipment that make you visible to the other drivers. Because rain makes it harder than usual for car drivers to see you, you should wear reflective accessories and a hi-vis vest. If you want to be sure that your prized possessions won’t get sulked, it might also be a good idea to Ziploc them before you hit the road. This is particularly important when it comes to electronic devices such as your phone. Your body position should not be neglected. 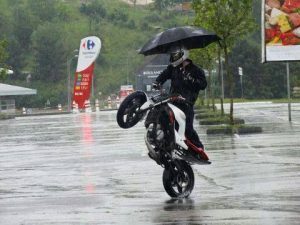 When riding in rainy weather, you can use the weight of your body to help the bike increase traction. As many fellow bikers recommend, you should keep your head as close to the mirrors as possible, as this extra weight can assist you when taking turns. However, keep in mind that adopting such a position will change the way in which you see the road. Hence, it is prudent that you train yourself to ride like this in the dry first. Also, if you happen to own a bike with huge ape hangers, you should refrain from doing so. Before you decide to ride in such conditions, you should also check to see the state of your tires. So, make sure that your tires are not worn out and that they have the correct pressure. Whenever available, you should try to ride in the dry tire tracks left by cars. Although it might seem fun to ride through puddles, you should avoid doing so. The main issue with puddles is that you do not know just how deep they are. If you cannot avoid one, keep the throttle steady and the bike in an upright position. Additionally, do not touch the brakes! Lastly, if you need a new carrier for motorcycle, be sure to read this guide! How Much Are Motorcycle Batteries? ​Young Choppers is the place where motorcycle and ATV aficionados have joined powers to share their knowledge about the best equipment for these two types of vehicles.